While many Americans are celebrating today with backyard barbecues, ice cold beers, and fireworks, us urban apartment dwellers have to find another way to get our ‘cue on. Luckily, finger-lickin’ barbecue chicken is easy to replicate in your home kitchen. Sure, there aren’t char or grill marks in the final result, but with this recipe you get tender, juicy chicken with a nice thick coating. For this recipe, I like to use bone-in dark meat. 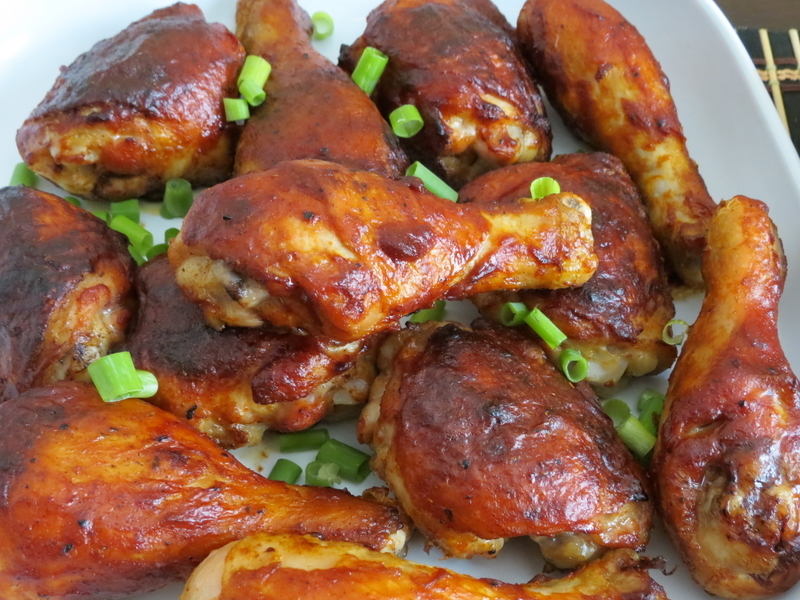 White meat works alright, but the flavors and moisture seem to come out better with legs and thighs. To cut some time off of the prep process, I use a bottle of good quality barbecue sauce. In this case, a bottle of Original Stubb’s BBQ sauce which I usually keep in my pantry for dipping. What you’ll need: cast-iron skillet or heavy-bottom saute pan, roasting pan, kitchen tongs, and basting brush. 1. Combine spices to create spice rub. Rinse chicken pieces and pat dry with paper towels. 2. Liberally rub chicken with spices and set in covered bowl in fridge for 2hrs or overnight. 3.Pre-heat oven to 350 degrees. Coat skillet with oil over medium-high heat until smoking, then sear chicken in batches until skin is crisp. Add more oil if needed. 4. When all the chicken is browned, place on roasting rack and bake until meat is cooked through (about 15-25 minutes). 5. Remove pan from oven and baste chicken liberally with sauce. Return to oven an additional 10 minutes. 6. Repeat process 2 more times until chicken is well coated and begins to get some good color. For a bit of artificial char, place chicken under the broiler for two minutes before removing from the oven. 7.Place in serving dish and sprinkle with chopped scallions. Serve hot. Nice rub … I make something similar with smoked Jalapeño. Smoked Jalapeño sounds delicious! I’m pretty wimpy when it comes to spice, but it’s worth a try.